You can have an amazing product, be a true innovator and could even have uncovered a way to satisfy an unmet demand and still not grow. Your processes and procedures could be razor sharp, your technology groundbreaking and your team the smartest and most talented in the market and you can still be stagnant. Unless you have these five key ingredients, sustainable growth will be undoubtedly something just beyond your reach. The good news is that none of these ingredients require capital, retooling or even necessitate a change in strategy. They simply require a paradigm shift, an adjustment in view, behavior and attitude. 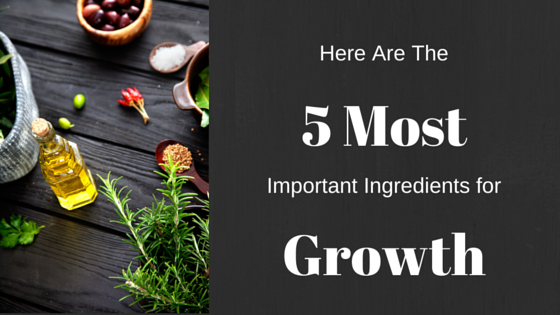 Unless you have these five key ingredients, sustainable growth will be undoubtedly something just beyond your reach. The first ingredient is clarity. You must clearly define your organization's purpose, its vision, values and desired outcomes. Let's break each one of these down a little deeper. Organizational purpose is your call to action. It is what gets you and everyone in the organization out of bed in the morning. It is your rallying cry, the unifying force of the company. Vision is your definition of success. You have to know what the finish line looks like if you are going to compete. The values of an organization are more than just its moral compass. It is its personality, its culture. The values are the descriptors used by people when they talk about what it is like to work for or do business with the company. It is critical to control that conversation. Desired outcomes are the measurable proof points that you have achieved your vision, that you have in fact won the race. A company that is foggy or confused with any of the above is a company not primed for growth. The values of an organization are more than just its moral compass. It is its personality, its culture. The second ingredient forth growth is knowing your path. It is critical that you are able to see and understand what will get you to your desired outcomes. Your path is the action steps that must be taken, they are your deliverables. This is the organizational roadmap which includes the milestones that when passed should be predictive of the achievement of your desired outcomes and the manifestation of your vision. If you don't know what actions need be taken, then nothing meaningful will get done. The third ingredient is the development of your leaders. Leadership is about getting things done through others. The more capable your leaders are, the more things get done. But, today's leadership is more than just drive, accountability and performance. It is about people and the ability to make them feel heard, cared for, valued and respected. This is integrative leadership, which is the blending of the strategic and tactical with the mind and spirit of those you lead. Companies whose leaders aren't present to validate and listen to their team are never going to get the kind of output needed to drive real growth. It is about people and the ability to make them feel heard, cared for, valued and respected. The fourth ingredient is having enlightened employees. These are employees who know their role and understand how it connects to the organization's purpose and vision. They see that their contribution matters. Enlightened employees feel their values and personalities are aligned with those of the company. They are inspired by their leaders and are loyal because they make them feel heard, cared for, valued and respected. These are employees that will drive growth. The fifth and final ingredient is to practice mindful sales and marketing. In my last article, "If you Want to Grow, you Need to Stop Selling" I wrote about how the traditional art of selling is dying. The "push" concept of marketing is close behind. The mindful approach to sales and marketing, is a "pull" strategy and it is comprised of four key steps; questioning, listening, learning and committing to adding value in every interaction. People don't want to be sold, they want to be heard and informed. Companies that recognize this, will be positioned for growth. People don't want to be sold, they want to be heard and informed. I recognize that what I have laid out here is radical, and I am sure there will be many differing opinions as to the efficacy of this approach. So, I would welcome the discussion. Please use the comment section below to share your thoughts or to take issue with any of my ideas. I will do my best to respond to each and every one. Elliot Begoun is a Business Growth Consultant and the Principal of The Intertwine Group. His purpose is to help businesses and business leaders grow. He works to solve real issues, establish strategic guardrails, develop integrative leaders and foster employee enlightenment. This article first appeared in the GROW Blog.